Puppies are all individuals. 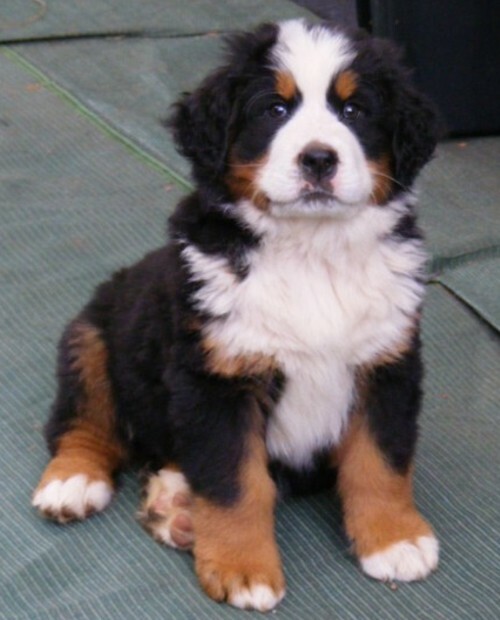 There is nothing more cuddly and cute than a Bernese baby puppy, so you should enjoy this early period with them as much as you can. Some puppies will “take after” their father, mother or even grandparents eg there will be those who are mischievous, those that love toys, those that love to sneak off with items of your clothing (especially shoes!!). Some are more playful, some are more attentive and some just want to go with the flow. Some puppies make excellent obedience prospects, some are lazy and others just like having fun. 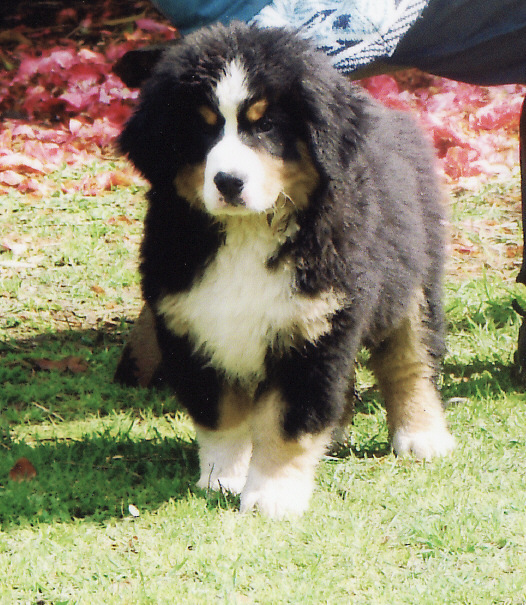 I can help you choose a suitable puppy by the temperament traits I observe while they are growing up. I will help you understand the health issues within the breed and the screening processes in place. What is your priority - a family companion pet, an obedience prospect or a show/breeding dog. 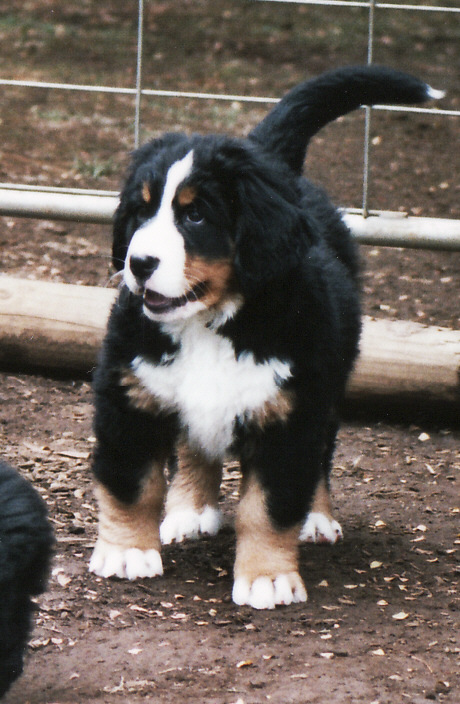 With your priorities in mind I will help you to secure a puppy with the attributes that are most important to you. Be clear about what you expect in your puppy. We can discuss all of this and any other questions you may have so that you are 100% comfortable with your selection. Each Dharmansk pet puppy will have Limited Registration and purchasers will be provided with this paperwork, an information booklet with a brief history on the breed, grooming, feeding, training, housing requirements etc etc. a vaccination and worming certificate will be provided with information on the next step. Your puppy will have been health checked before it leaves this establishment. All Dharmansk puppies are exposed to a range of environments and activities such as outdoor dog kennels, and different surfaces, car rides etc during their impressionable period in the litter to facilitate adjustment to their new home environment. I seem to always have quite a waiting list for puppies so it is a great idea to visit and get your name down early. It is sometimes more difficult if people have their heart set on a male or a female because the litters can be heavily biased in one gender eg 6 females and 1 male. Obviously in this situation it will not be possible to help more people after a male puppy if they are not flexible, so being on the top of the waiting list is the best position to be in!! I find the 'general' character of a puppy is reasonably predictable. Overall proportions seem to stay the same but height can be difficult to interpret with some puppies. So, seeing the parents will give some guide as will any history of size in any previous litters. Pet puppies are best de-sexed and this will be discussed with you at the time depending on the choosing of your puppy. As part of the feedback process for me to maintain improvement in the dogs I breed, I would like as many of the siblings of each litter evaluated for hip and elbow soundness as is possible. Maintaining improvement in my breeding program is served well with a 'first year evaluation' of progeny which I like to do wherever possible, so that I can understand the pups progress through their first year and the temperament conditioning that has occurred during that time. Feedback from this process enables me to fashion decisions in the breeding program to promote and achieve ongoing improvement. To date I have had 100% co-operation with all good feedback. I am most grateful to everyone for their co-operation with this so that the whole picture can be understood. Once home with your new family member there is much to do and learn together and one of the most difficult tasks in the immediate future is to ensure that your new puppy has adequate socialization. This is seemingly at conflict with vaccination recommendations and so creates the dilemma of just how to go about giving the puppy the groundwork he needs during this valuable window of opportunity of learning, without putting him at risk. Check with your Vet and attend the 'Puppy Socializing Classes' as these are a great way to get started. Having friends around and visiting friends who have vaccinated dogs and taking short trips in the car are all very helpful. Puppies should meet as many different people as is practicable and enjoy a variety of experiences. This is one of the most valuable contributions you can make to your puppies social wellbeing. Most of all, enjoy your new puppy and friend.